Some 57 properties in the isolated rural village of Drimnin (West Highlands, Scotland) can now access broadband speeds of up to 50Mbps. The new fixed wireless network reflects a community collaboration with Scottish Sea Farms, which has resulted in a new ISP being setup called Drimnin Community Broadband CIC. Gaining access to “superfast broadband” can still be very problematic in many parts of rural Scotland and the United Kingdom, where deploying new fixed line networks is often disproportionately expensive. Meanwhile many such communities have also grown tired of waiting for the Government to come up with solutions and have instead sought to build their own. The small village of Drimnin, which is tucked away at the end of 30 miles of single-track road from the A861 in the West Highlands and overlooks the waters of the Sound of Mull, is one such location. The community itself is comprised of just 57 properties, a village hall, a post office that’s open twice a week and a whisky distillery. But the latter has not helped locals to forget about their dire internet connectivity. 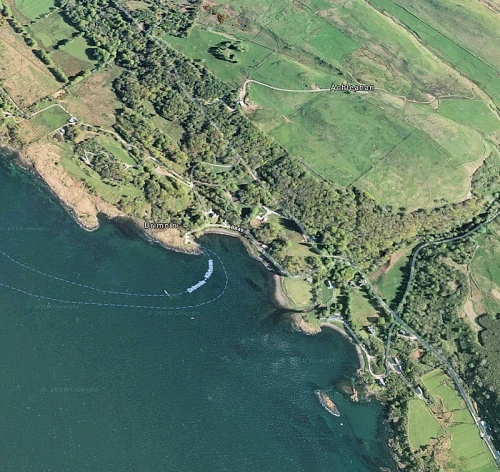 However the good news is that Scottish Sea Farms (SSF), which has also helped to connect another rural Scottish community (here), have been able to help as part of their effort to enable remote feeding at its salmon farms around the Sound of Mull (i.e. for those times when severe weather makes it unsafe to travel out by boat to the pens). The solution came via a complex Fixed Wireless Access (FWA) network, which used a bunch of repeaters operating in the 23GHz band to link back into Tobermory (see image at the bottom of this article). At the same time locals have established a new Community Interest Company (CIC) – Drimnin Community Broadband – to help provide the broadband service to nearby premises. “Traditionally, a wireless radio link requires a direct line of sight, however the exposed location of some of our farms combined with the natural geography of the area meant this wasn’t an option. Our proposed solution, in partnership with wireless specialists Rapier Systems, was to effectively ‘bounce’ the signal back and forth from different locations, but this was dependent on us securing permission to install the necessary masts and repeaters at the most suitable locations. Initially some 40 of the village’s 57 homes and businesses signed-up in advance via a 2 year subscription, which enabled the ISP to place an order for its own 200Mbps leased line from BT, organise construction works and even start digging the trenches for the power cables. This work has since completed. SSF is understood to have contributed £55,000 to help build the network, while a further £12,500 came from the Morvern Community Trust and £10,000 from the National Lottery Fund. This helped to cover the costs for the new infrastructure and its installation. “Equally important though was ensuring that the new service would be viable to run in the long-term, so we introduced two price packages that makes it affordable,” said David Campbell, one of the CIC’s founding members. Locals currently have a choice of paying either £27 per month for a package that offers unlimited (Fair Usage Policy) maximum download speeds of up to 7.5Mbps (2Mbps as a minimum) or £50 for the top speed of up to 50Mbps (10Mbps minimum). “Being in the middle of nowhere, Drimnin is the sort of community where we do lots of things for ourselves, but this particular project has been hugely popular with everyone in the village. The whole community pulled together to help make it happen,” added David. 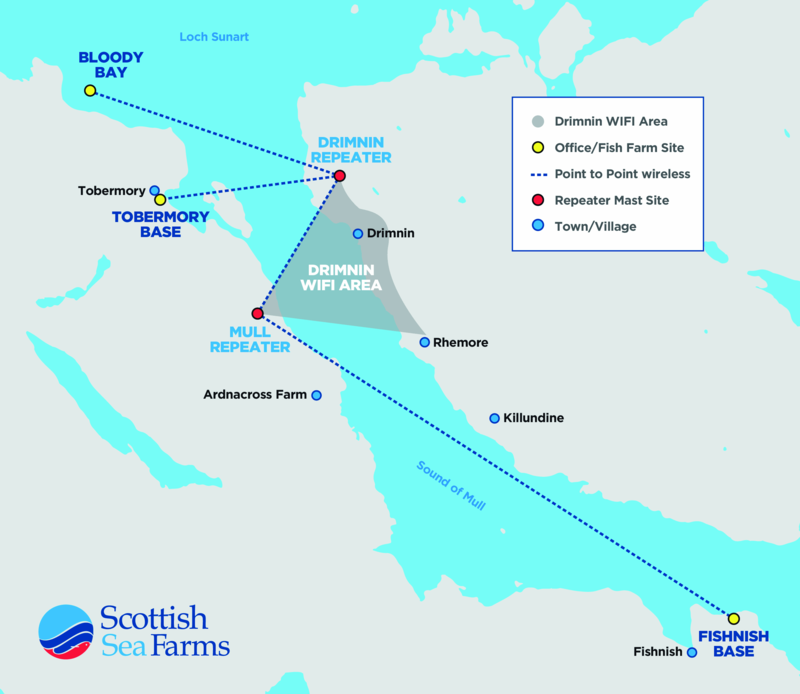 Scottish Sea Farms is now understood to be in talks with a third remote local community about bringing similar connectivity to its farms and the surrounding area. Well done Drimnin, power to the people. JFDI in action. With 57 premises to serve, the USO ‘pot’ would be £193k, while I applaud the scheme, I do wonder if they would have been better waiting for USO delivery. Worth noting that the USO cost sharing isn’t quite as simple as 57 x £3,400 (cost threshold) and must be balanced against expected % take-up. Ofcom states that where network infrastructure can be shared, build costs should also be shared between premises to determine whether the cost of provision to an individual premises would fall below £3,400. For example, if a cabinet served 100 premises and the cost of deploying FTTC was £100K, an assumed take-up of 70% would mean that the cost of upgrading that cabinet would be just £1,429 for each property (Ofcom’s example). At the time of the last update Ofcom proposed setting a 70% forecast take-up for the purposes of calculating the cost of provision of a USO connection (Broadband Deliver UK has shown that similar FTTC deployments are already reaching or exceeding c.50% take-up and BT is currently forecasting 61%). The regulator initially felt as if 80% was a better long-term view, although they ended up choosing 70% as the middle ground. I guess they made the decision long ago but I tend to agree USO might have been more obvious. USO – a promise, got a date to it, but who believes it ?? If the resources aren’t available or mobilised to deliver it, a legally-mandated “entitlement” doesn’t magically make it appear. This solution – in and running now. If more than 70% actually signed up (as could easily happen in a small community) then I would have thought the funding available would increase to reflect the actual number signed up, not be limited to 70%. Can’t disagree, quite how BT will cope is still an unknown, badly is my expectation. That’s largely irrelevant because the 70% is a long-term forecast assumption to help with costing, while natural take-up takes time to grow. So by the time the area actually gets to 70% on the USO solution then it will usually be a long time after the new service has been installed (in most cases several years). Of course you may get some rare areas where 70%+ manage to request the USO at the same time but so far as I can tell the operators must still work to the 70% assumption as a base case. This IMO is actually better than allowing flexibility, which might end up costing many communities more if they deliver lower take-up. For the USO its important to not think of a pot of money @£3400 per property. Really it should be considered backwards – the cost of delivering a compliant service for a cluster is calculated and then the Ofcom takeup % is applied against the property count and if that falls below £3400 per property then the build will take place. At the moment there is no proposal for innovative solutions to be used (such as this wireless network) and be funded by the USO… I suspect that may come in time, down the line, once the delivery of the USO is underway and the numbers of those properties that exceed £3400 become apparent to both property owners and politicians. THB I think FTTC has been milked as much as it can be by now. The tiny number of vaguely suitable FTTC sites left are marginally on the FTTC rather than FTTP side that you really do have to question if FTTC is a wise use of funds particularly if as you say there are not many of them and the FTTP provides a long term solution with backhaul that can be leveraged in the future for other things. While the public / political ambition may be full fibre, the USO design is on Value. I said tiny because inevitably there will be some FTTC build under the uso and it’s not realistic to suggest end users should expect just FTTP from the USO. I hope that planners do weight the longer term value in FTTP, but if you look at CFP costs, FTTC is still ~ 1/3 of the cost of FTTP and the old argument of increamentally getting the fibre deeper offers the best value. I seem to remember data that 80-110 bduk cabs now have Gfast so they are trying to squeeze the last out of them over fttp where they can. @Joe – I doubt its that high for BDUK cabs with Gfast – they simply dont meet the criteria apart from in a minuscule number of situations – there is Hunslet 62 near Leeds which was pretty unique case – any others? Gfast has no role in the USO however – so I’m not sure I follow your point? Copper delivery in the USO will be a few AIO cabs and some remote communities with centrally located PCP’s but long fibre paths, that missed the BDUK cost ceiling. LR-VDSL and FTTrN have all been ruled out, thankfully, which improves the cost argument for FTTP when possible. The figure was on TB a few days back certainly that range. Only insofar as bduk and USO are similar situations in many cases. Well firstly it’s the A884 as the A861 is on the other side of Loch Sunart on runs no where near that part of the islands, the A884 is 41 miles long and Drimnin is 11 miles off the A884 on the B849 junction at Movern – still nothing like good facts in a story. That is taken directly from their message to me and I also thought it odd, but at the same time I tend not to question those who live locally as they know far more than me about the area.